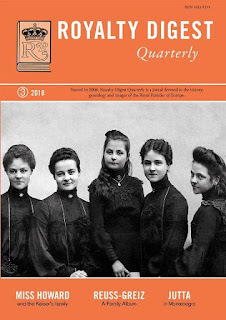 I really enjoyed the latest issue of Royalty Digest Quarterly (no. 3, 2018). There were several articles about royals and royal families that I knew little about, so I felt I got full value this time, and I trust that other readers feel the same. The five daughters of Heinrich XXII, Prince (Fürst) Reuss zu Greiz, adorn the front page this time, meaning that Charlotte Zeepvat has devoted her traditional Family Album to the House of Reuss zu Greiz. The daughters were Emma, Marie Agnes, Karoline, Hermine and Ida. The latter is surely the one in the middle, while I will not make a guess on the others. Hermine (1887–1947) is the most famous of the sisters, as she in 1922 married the exiled Emperor Wilhelm II. She was previously married to Prince Johann Georg of Schoenaich-Carolath (1873–1920) and had 5 children by him. Interestingly enough, a second cousin of Prince Johann Georg, Princess Karin-Elisabeth (1900–1966) married in 1933 the Norwegian banker Christoffer Blom Heimbeck (1885–1967). They were both members of the Norwegian nazi party Nasjonal Samling during WW2, but that is a story I will get into another time. Karin-Elisabeth and Christoffer's eldest daughter Ingrid (1934–2016) was in 2000 married to her second cousin Count Wolfgang von Schimmelmann (1921–2004). Of course none of this was mentioned in Zeepvat's article, I just get carried away here because of the Norwegian connections. There might be other family connections between Hermine Reuss zu Greiz and the Schoenaich-Carolaths which make the connection between her and Karin-Elisabeth closer than through her husband, but I haven't got the time to look into it right now. Two of Hermine's children were present at the Heimbeck wedding, I should add. But I cannot forget to mention that the said Reuss sisters had a brother, Prince Heinrich XXIV (1878–1927), who was the last (at least in name) reigning Prince (Fürst) of the small Reuss zu Greiz principality. According to Zeepvat, «the mental and physical disabilities he suffered as the result of a childhood accident made him incapable of reigning», and his regent was originally Heinrich XIV, Prince (Fürst) Reuss zu Schleiz (1832–1913). I gather that his son Heinrich XXVII (1858–1928) was the second regent. Anyway, Zeepvat tells the story of the Reuss elder line and all the Heinrich princes (all the princes are named Heinrich followed by numerals which were supposed to go up to 100 before it would start all over with no. I again, it never did as the house died out with Heinrich XXIV mentioned above. In addition to the introduction to the Reuss zu Greiz family, the readers are treated with 43 illustrations of various family members and palaces, as well as two pages with genealogical tables. The first shows one (of surely many more) connection between Reuss zu Greiz and the Norwegian Royal Family. But before we come as far as to the Family Album, Charlotte Zeepvat has also made another contribution, 'My Dear Miss Howard. Serving the Kaiser's family', which tells the story of Ethel Howard (1865–1931), who served as the governess of Emperor Wilhelm II and Empress Auguste Victoria's elder sons from 1895 to 1897, while from 1900 to 1908 she was in charge of the upbringing and education of five orphaned Japanese princes! She later published her memoirs (Potsdam Princes, 1916, and Japanese Memories, 1918, but the article is mainly based on a collection of her papers which have recently emerged on the collector's market. Before the Reuss article starts, the readers have arrived at column The World Wide Web of Royalty, which usually is placed at the end of each issue, but this time appears quite early on. Anyway, the column this time gives us genealogical news from the imperial, royal or princely houses of Austria, Denmark, Bourbon-Parma, Mecklenburg-Strelitz, Saxony, Saxe-Coburg and Gotha, Solms-Laubach, Waldeck and Pyrmont and Thurn and Taxis. Following the Reuss article, Michael L. Nash takes over with the article The Belle of the Coronation Ball. Emperor Alexander II had succeeded the year before, but because of the ending of the Crimean war, the coronation was delayed. The belle of the ball was Princess Ekaterina Dadiani (1816–1882), née Chavchavadze, who served as Regent of Mingrelia (Western Georgia) for some time. Not often we can read about the various monarchies and reigning families in Georgia, so this was an interesting encounter. Queen Marie of Bavaria, née Princess of Prussia (1825–1889) had a life-long love of the mountains, of climbing and hiking, and Elizabeth Jane Timms takes us to Marie's retreat in Elbigenalp in the Austrian state of Tyrol. It is not the first time that Royalty Digest Quarterly provides an article about the royal family of Montenegro, but I am confident that it is the first time that Jutta, née Duchess of Mecklenburg-Strelitz (1880–1946) is portraited. The author is Marlene A. EIlers Koenig. Jutta was married to Prince Danilo of Montenegro in 1899 and took the name Militza following her conversion to Orthodoxy. WW1 and later Montenegro's incorporation into the Kingdom of Serbs, Croats and Slovenes (later Kingdom of Yugoslavia) forced Danilo and Militza into exile. They lived rather separate lives. Danilo died in Vienna in 1939. Militza lived in France and later in Italy, where her sister Elena was Queen, and died in Rome in 1946. Koenig mentions that Militza was buried at the Non-Catholic Cemetery for Foreigners in Testaccio, Rome, i.e. Il Cimitero Acattolico di Roma. I might not have paid enough attention to Militza's life in exile, as the information on her place of burial was new to me. I visited the cemtery around a year ago and thought I had prepared well for the visit! I can't find Jutta or Militza's name listed at the website at all. I photographed numerous graves of people of Norwegian or Scandinavian origin, including the last resting places of the historian Peter Andreas Munch (1810–1863), in addition to the grave of Prince Felix Youssoupoff (1856–1928), the grave of the poet John Keats (1795–1821) and many others. When you visit the cemetery, you are able to search for the names of all the people buried there, but as I didn't know of Militzia's grave, I never looked for it. Surely I must have passed the grave, but when looking at a photo of it tonight, I must say it was certainly not a headstone that would scream out for my attention. Well, well, it only means that I have to visit the cemetery again another time. Speaking of royal graves, the Danish Ove Mogensen has for many years taken a great interest in this topic, and there is hardly a royal grave he hasn't been to. Well, not to the grave of Karin-Elisabeth Heimbeck, Princess of Schoenaich-Carolath, I am sure! But anyway, I just love his articles on royal graves, and his contribution Tombs, Graves and Monuments. Burial Places of the Bonaparte Dynasty [Part] I certainly didn't disappoint me. I look forward to reading the second part! Coryne Hall then gets the honor of providing the last article of the present issue, Prince Ataulfo of Bourbon-Orleans (1913–1974) in the series Little-Known Royals. He certainly deserved the description little-known, and Hall gives a good survey of his miserable life. Ataulfo, his brothers and parents, Infante Alfonso, Duke of Galliera (1886–1975) and Beatrice of Saxe-Coburg and Gotha (1884–1866) are buried in the Capuchin convent in Sanlúcar de Barrameda, Spain, yet another place I hope to visit one day. The Queen, Duke of Edinburgh, Prince of Wales, Duchess of Cornwall, and Duke and Duchess of Cambridge are delighted for the couple. Ms Doria Ragland is very happy about the lovely news and she looks forward to welcoming her first grandchild. The happy news was published first today in order not to overshadow the York Brooksbank wedding on Friday, and the public was informed shortly after the expecting couple had landed in Sydney, Australia. In the next 16 days the Duke and Duchess of Sussex are going to carry out 76 engagements in Australia, Fiji, Tonga and New Zealand. The decision to tell the happy news to family and friends at the royal wedding on Friday has obviously caused some critical comments in various social media. I prefer to focus on more important and interesting aspects, such as constitutional matters. The baby will be born into the world as no. 7 in the line of succession to the British throne, after his or her father, and before Prince Harry's uncle the Duke of York. It will also mean that the Earl of Wessex will no longer be included in the top ten list. On 31 December 2012, the Queen decided by Letters Patent that «all the children of the eldest son of The Prince of Wales should have and enjoy the style, title and attribute of Royal Highness with the titular dignity of Prince or Princess prefixed to their Christian names or with such other titles of honour.» (Published in The Official Gazette on 8 January 2013). If this decision had not been made, Princess Charlotte would have been styled Lady Charlotte Mountbatten-Windsor and Prince Louis Lord Louis Mountbatten-Windsor. In other words, the baby, if a girl, will be styled Lady X Mountbatten-Windsor, while a boy will by courtesy be styled Earl of Dumbarton, which is the Duke of Sussex's second (lesser grade) title. But as already mentioned, the Queen could decide to issue a Letters Patent equal to the one published in 2013. In my opinion, that would be the best way forward, as the child would eventually, unless the Letters Patent of 1917 is changed in the meantime or the Sussex decides on something similar to the Wessex solution*, be upgrated to Prince or Princess as soon as the Prince of Wales succeeds to the throne. The baby would then of course be a grandchild of the monarch. But one thing is my private opinion, which really doesn't matter that much, another is what the Queen decides. Many people have argued that the Letters Patent of 1917 should be changed in order to reduce the number of royals (i.e. royal princes and princesses). But I would question the necessity, as the current number is bound to drop when the oldest generation dies out anyway. There are limits to how small the number of working royals can be, considering the relatively large British population and all the Commonweatlh countries where the British monarch serves as head of state. Even if the role of the monarch and the royal family is changed, they will still be on demand to carry out many engagements. Therefore I personally think it is a pity that Princess Beatrix and Princess Eugenie of York, as it appears today, have not been asked to become working royals. I am sure they would do a great job. With the York princesses out of the question, the number of working royals could some time in the future be limited to William, Catherine and their 3 children as well as the Duke and Duchess of Sussex. Having the latter's child or children on board as well would in my opinion be an advantage. It will be interesting to see what the current and future monarch finally decide. Another matter is of course that the Letters Patent of 1917 some time in the future has to be brought into (better) agreement with the Succession to the Crown Act 2013. * «On June 19, 1999, at the time of Prince Edward's wedding, it was announced that The Queen had decided, with the agreement of Prince Edward and Miss Rhys-Jones, that any children of their marriage should not be given the style of His or Her Royal Highness, but would have courtesy titles as sons or daughters of an Earl.» The children of the Earl and Countess of Wessex are therefore styled Lady Louise Mountbatten-Windsor and Viscount Severn. Updated on Tuesday 16 October 2018 at 22.45 (I wrote from the future baby's point of view and managed to write that the Duke of York was Prince Harry's great uncle while in fact he is of course his uncle. The typical mistake one makes when one think one thing and write something else ...). Princess Eugenie of York and Jack Brooksbank got married at St. George's Chapel at Windsor Castle on Friday 12 October 2018, and I posted a short blog article later the same day. I am quite certain that The Telegraph by Sheik Hamad means the former Emir, but I am not 100 % sure. And there are several sheikhs named Suhaim and Fahad (Fahd), as the genealogy website The Royal Ark demonstrates, so it is not easy to make a well-educated guess. But Fahad (Fahd) might be the elder brother of the current Emir, Tamim, while Suhaim is one of the nephews of Sheik Hamad and thus a cousin to Tamim. The Telegraphs also adds the Hereditary Prince and Princess of Oettingen-Oettingen and Oettingen-Spielberg to the party, i.e. Franz-Albrecht and Cleopatra. They were also present at the Sussez wedding in May. Not a royal, but Count Nikolai von Bismarck was also present, accompanied by his girl-friend, the well-known model Kate Moss. The wedding of HRH Princess Eugenie of York, youngest daughter of HRH The Duke of York (Prince Andrew) and Sarah, Duchess of York, née Ferguson, and Jack Brooksbank, eldest child of George Brooksbank and Nicola Brooksbank, née Newton, took place at St. George's Chapel, Windsor Castle today 12 october 2018 at 11 a.m. local time. The Dean of Windsor, David Conner, officiated the ceremony. Princess Eugenie's elder sister Princess Beatrix served the role as maid of honour, while Jack's brother Thomas was his best man. The order of service can be viewed here. Bridesmaids were Princess Charlotte of Cambridge, Savannah and Isla Phillips (daughters of Peter and Autumn Phillips, the former the son of the Princess Royal (Princess Anne) and thus a first cousin of the bride), Mia Tindall (daughter of Mike and Zara Tindall, the latter the daughter of the Princess Royal and thus another first cousin of the bride), Maud Windsor (goddaughter of the bride and daughter of Lord Frederick and Lady Frederick Windsor, née Sophie Winkleman, the former a second cousin of the bride) and Theodora Williams (daughter of the artist Robbie Williams and his partner Ayda Field). Page Boys were Prince George of Cambridge and Louis de Givenchy (son of Olivier and Zoe De Givenchy, friends), while special attendants were Lady Louise Mountbatten-Windsor, who took good care of the bridal party, and Viscount Severn, both children of the Earl and Countess of Wessex and thus first cousins of the bride. Most members of the British Royal Family attended the wedding, including Queen Elizabeth, Prince Philip, Duke of Edinburgh, the Prince of Wales, the Duke and Duchess of Cambridge and the Duke and Duchess of Sussex, the Princess Royal (Princess Anne) and Sir Timothy Laurence, the Duke of York (and hs former wife Sarah, Duchess of York), Princess Beatrix of York, the Earl and Countess of Wessex. Also present were the Phillips and the Tindalls and most of the Kents and Gloucesters. Absent were the Duchess of Cornwall, who had other official commitments decided before the wedding date was set (for the tabloids and some royal watchers who think this was a snub: you have won the competion of sillyness) and Princess Alexandra, Lady Ogilvy. As for other guests, and based on comments on Twitter and Nobiliana, members of the Greek Royal Family included Crown Prince Pavlos, Crown Princess Marie-Chantal, Princess Maria-Olympia and Prince Philippos with his partner Nina Flohr, while the Hannovers were represented by Prince Ernst August and Princess Ekaterina and Prince Christian and Princess Alessandra. Present were also representatives of various charities which Princess Eugenie is associated with as well as many other relatives and friends. 850 people were invited to attend the ceremony and the reception, and judging from the various news reports, lots of celebrities were in attendance. As the wedding took place in the middle of the day while I was at work, I have not been able to watch much, and will therefore not comment on all the guests. I am sure a list will be compiled at Nobiliana in the near future. The wedding ceremony was followed by a reception in St George's Hall hosted by the Queen and later a party at The Royal Lodge.